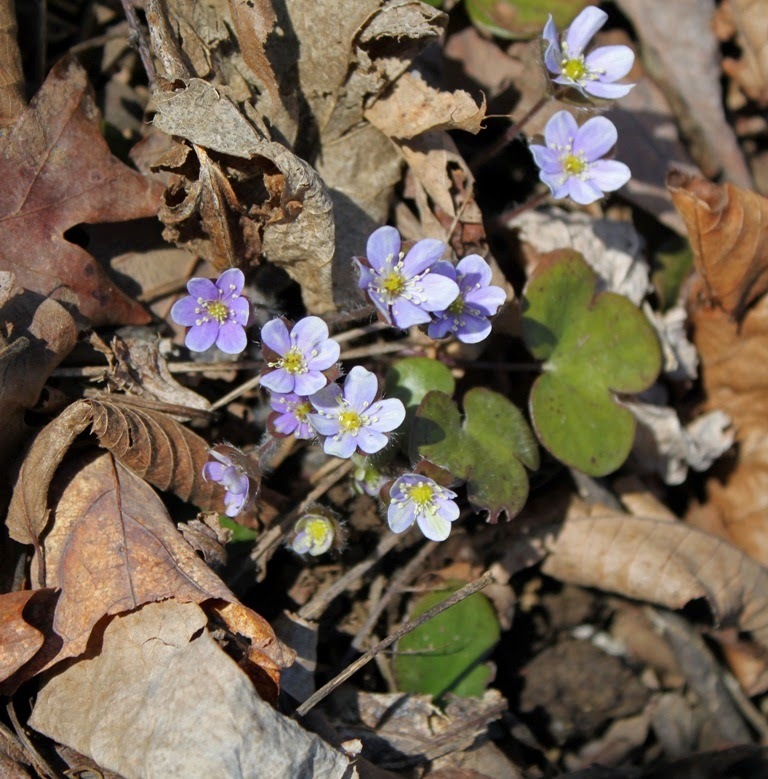 The forest’s first, tiny ephemeral flowers are blooming at Roundtop. In addition to the yellow dog-toothed violets I found several days ago, I’ve now added bloodwort, rue anemone and coltsfoot. All of these flowers are small and easy to overlook. Coltsfoot is the most obvious of the three new species I found yesterday, and even that one is easy to overlook. The flower looks so much like dandelion that I believe a lot of people overlook it because of that. But though the flowers are similar, the similarity ends there. 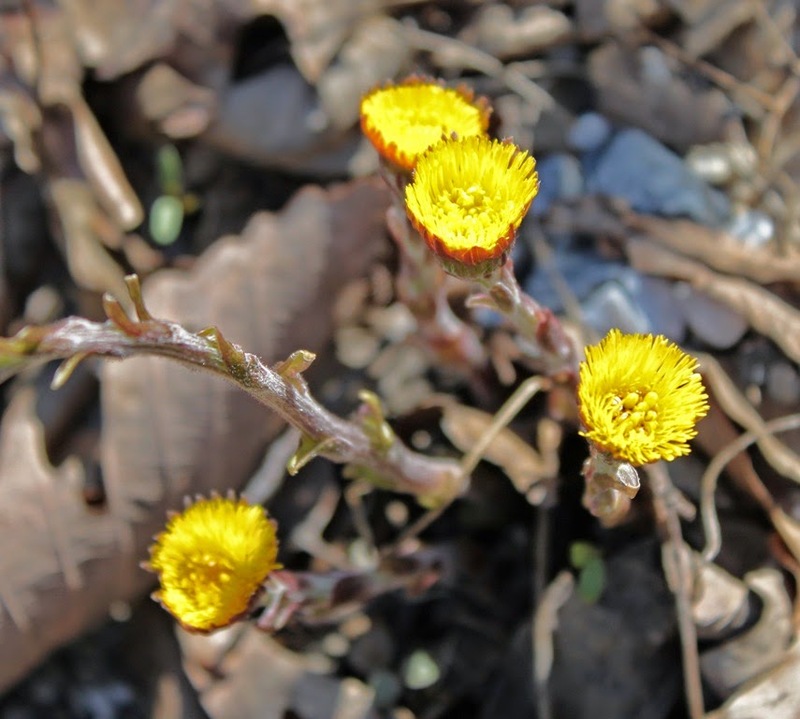 Coltsfoot is taller that most dandelions and the plant flowers before you find any leaves. Often, it is the first new flower I find in the spring, but not this year. 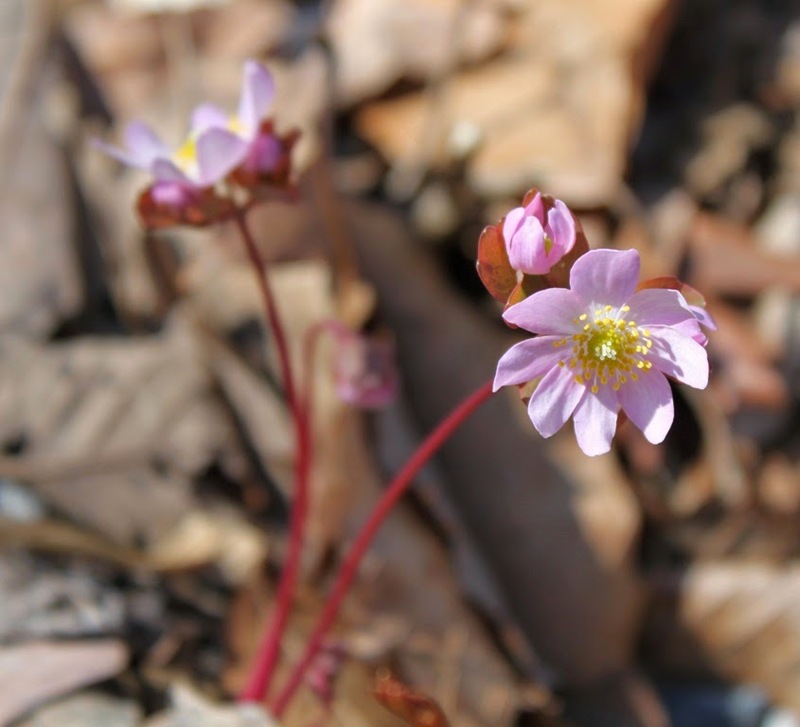 Bloodwort is another tiny plant. The flowers are about half an inch and the waxy, clover-shaped leaves are perhaps 2-3 inches. An entire plant may be only 3-4 inches long. I found just two plants of this one, within 4-5 feet of each other. Likely, there are more that I haven’t found yet. Rue anemone is a common plant in my forest. Every year I have multiple plants that vary in shade from white to a nice lavender. This plant is no larger than bloodwort but it grows much more densely, and I often find 10-12 plants in one area. Even a tiny flower is hard to overlook when so many are grouped together. Finding spring’s first flowers is a true sign of spring, along with the appearance of that lovely little Eastern blue butterfly. This weekend I also had golden-crowned kinglets, ruby kinglets and a pair of very curious blue-gray gnatcatchers. For the first time this year, I finally feel confident that I can finally put those snow shovels away! The latest chill (and I sure hope it was the last big one of this season) is easing. The dog-toothed violets appear to have come through okay for the most part. I have yet to see any other flowers in the forest, but I am beginning to notice a green "haze" around some shrubs. That haze will no doubt soon become leaves, perhaps tomorrow when the temperature warms to seasonal levels again. In the mornings, I hear two summer visitors—the eastern phoebe and the robins among the ever-present cardinals. Now is the time of year when, for a few days, I have both robins and juncos. It always seems odd to me to see the northern visitors and the southern visitors together. The togetherness doesn’t last long. Many of the juncos have already left. 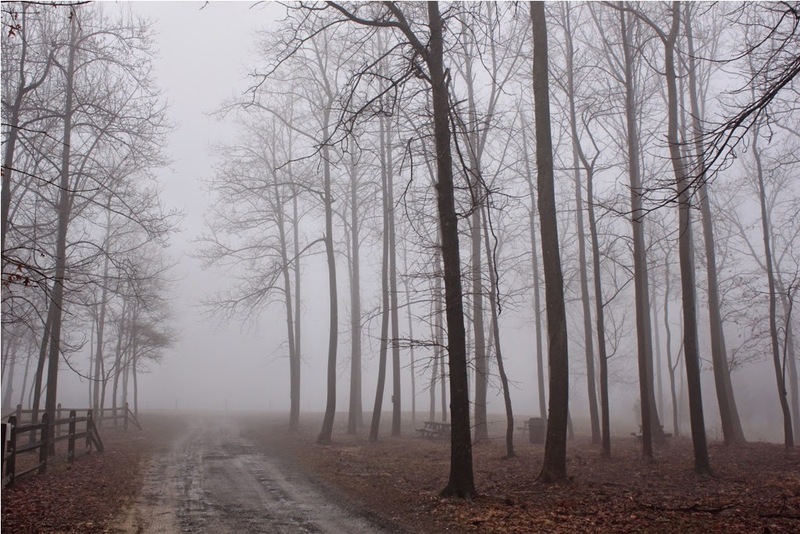 As yet, I’ve not yet heard the song of the wood thrush or the cry of the ovenbird. It is still a few days, perhaps a week, too early for them here. I expect them about April 23, though occasionally they are 3-4 days later than that. Once they arrive, the morning chorus of bird song will be in nearly full voice, loud enough to wake me up in mornings without the need for an alarm. For now, the forest shows signs of waking up after a very long, winter nap. It still has a ways to go, but the slumber is ending. What happened in the last 24 hours? Let’s see..the temperature dropped nearly 40 degrees in about 12 hours, and torrential rain turned to driving snow, though it didn’t accumulate. Worst of all, I was forced to turn my heat back on. This morning the temperature was 24 at the cabin, a number the little dog-toothed violets did not like at all. Those flower stems were closed up tighter than tight this morning. I don’t know if warmer weather will revive them or not, so I will have to wait and see. Tonight’s temperature will also drop below freezing again, if not quite so far or so precipitously. None of us should be surprised. It’s been the kind of year where atypical weather is normal. And it’s only April. Ah, the first flower of spring has appeared. Just past my front steps is an area that’s filled with dog-toothed violet plants. The first flower bloomed on Sunday, the first of many in this patch, which is covered with the pretty grey and green mottled leaves. The patch itself is about 4 feet by 5 feet and contains hundreds of leaves. The blooms are small and delicate, and the leaves far outnumber the blooms. In a good year, I might have 20 blooms, but the size of the patch and denseness of the leaves might lead you to expect 50 or more. I hope the flowers make it through the snow predicted for tomorrow. Yes, you read that right. Yesterday the temperature flirted with 80 (and no doubt passed that in some suburban areas). But Tuesday brings cooler weather, rain and sometime after dark, snow. It’s just that kind of year. One morning the heat is still on, but the air conditioner is needed in the afternoon. And then the heat is needed the next day. No, I didn’t lug my air conditioner out from underneath the kitchen table where it spends the winter. Nor, did I place it in my kitchen window, but I did use the AC in my car after a trip to the pet food store with Skye. Other spring flowers, like forsythia at my family’s farm, late to start this year, are blooming one morning and withering by the afternoon heat. The yellow violets are blooming the latest I’ve ever recorded, though only by 3 days. The earliest I’ve ever had them was March 21, which was still snow-bound here this winter. Usually, a blooming this late translates into a bloom that doesn’t last very long. The forsythia are certainly following that pattern. I have to look fast this spring, so I don’t miss anything. ...To visit his lady friends, of course. Two whole days without rain! I hardly know how to act. Of course, rain is forecast for Friday but I still get two whole days of sunshine and bright blue sky from horizon to horizon. It feels as though it’s been months since that’s happened. Even if it hasn’t been months, I’m pretty sure the other non-rainy days were overcast, so the sunshine seems a novel thing to see. The sunshine and warmer temperatures are starting to encourage the first signs of spring greenery. 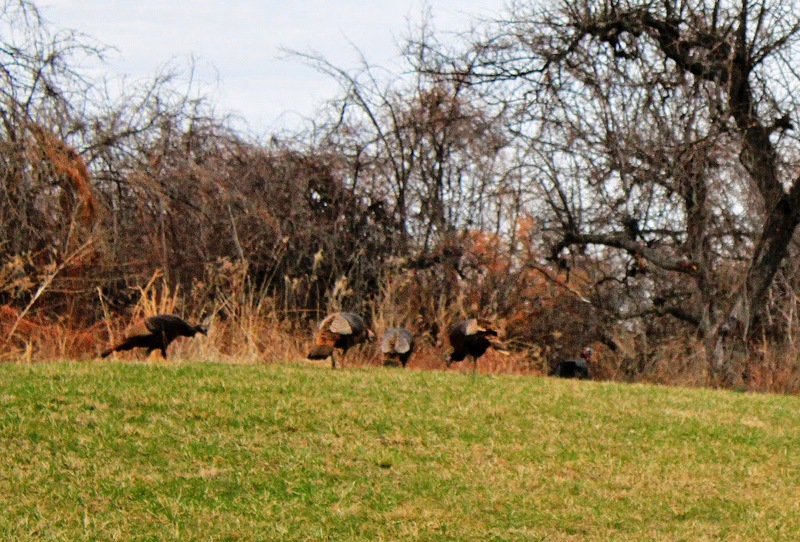 I’m seeing a few patches or shades of green on the yards, amongst the winter brown. 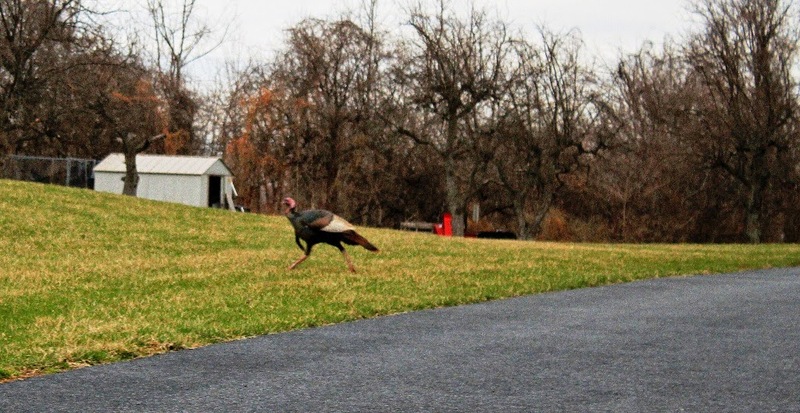 The weather has also encouraged flocks of wild turkeys to start roaming around again. This week I’ve seen them every day. All sightings have been within a mile of each other, so possibly it’s the same group. The local wood lots and orchards are their favored haunts, though I’ve also seen them in a cornfield that still boasts the shorn stalks from last fall and a fallow field. Sometimes I hear them gobbling in the pre-dawn hour from the safety of their forest roost. Around the cabin, I have discovered where the resident pileated woodpeckers are nesting this year. I have hopes of getting a few half-decent photos as the nest hole isn’t far from the cabin, and I think I can stand on my raised deck and be nearly eye-level with the site. I’ve also found where the flickers are going to nest, and that’s not too far from the woodpecker hole. The forest itself is still as brown as it was in winter. 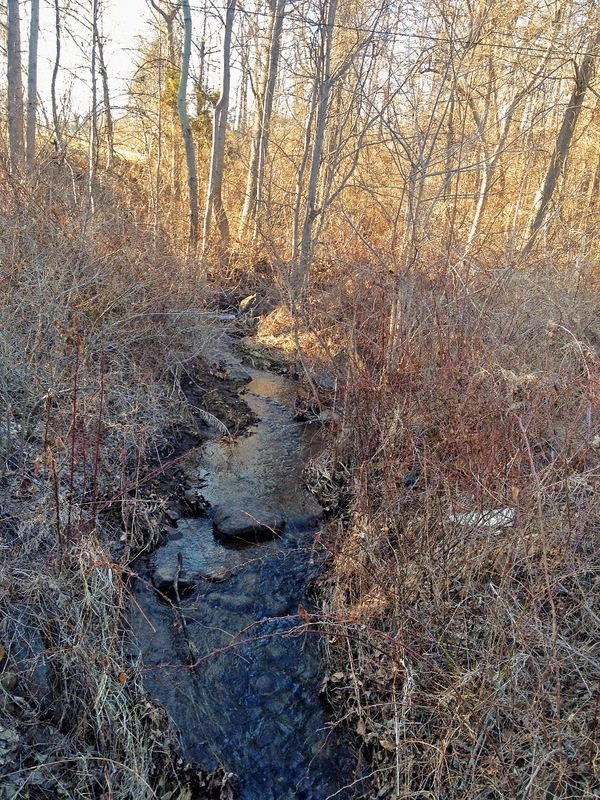 I find no sign of buds on the forest trees or on the smaller underbrush of the forest floor. The start of that can’t be far off, though—not with 60 degree temperatures and all this lovely sunshine! The first signs of new growth are appearing around Roundtop Mountain! 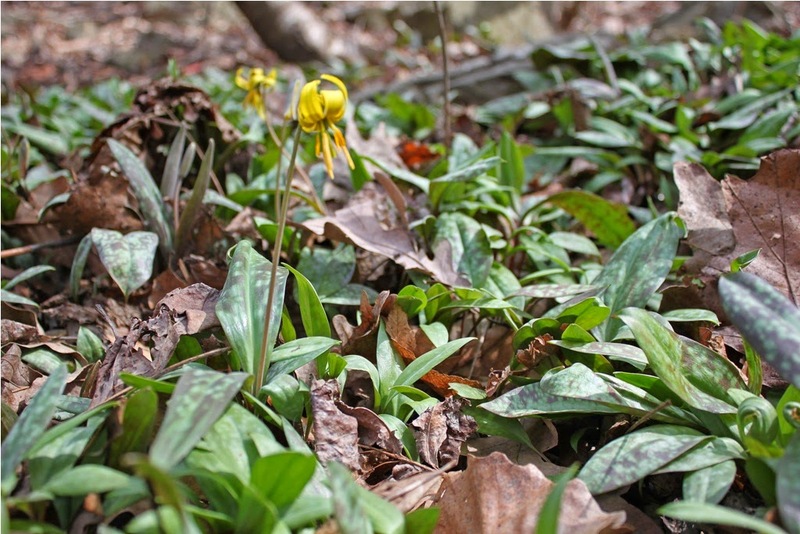 This morning I saw the leaves of the (pick one) 1) yellow dog-toothed violet 2) yellow trout lily 3) adder’s tongue 4) fawn lily were up. No signs of flower stems yet though. And the leaves of the one-day wonder, the bloodroot, are also breaking through the ground. That’s pretty impressive, considering I still had snow on the ground a week ago. The robins are singing, as are the juncos, who will soon be heading north again. More phoebes have arrived and call from both sides of the cabin. I also had a pair of golden-crowned kinglets at the cabin this weekend. I didn’t see any insects, but they were busy little things, so I’m sure they found something. It took me a while to identify them. They like to be in the higher branches of the trees, so I never get very good views of them, even with 10x binoculars, and seeing more than their bellies takes a bit of luck. 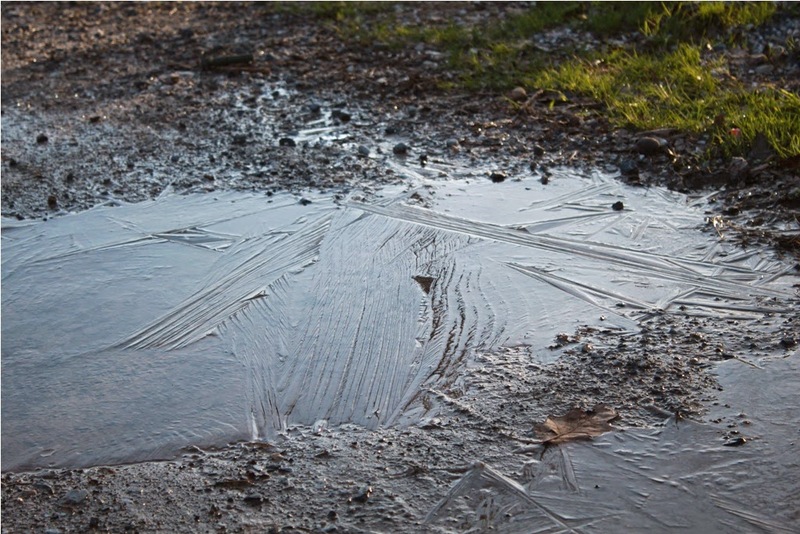 Mud remains everywhere, as are puddles and gushing seasonal streams. With the amount of water through these temporary streams, right now it’s hard to imagine that they won’t run all year long, but they don’t. Last night I saw a frog, too, my first of the year. It hopped in front of my headlights as I was heading back to the cabin after dark and was gone before could get out of the car to find out what kind it was. It wasn’t small enough to be a peeper or large enough to be a bullfrog. It was the size of a green frog or leopard or pickerel frog. Spring may have arrived later than usual, but the season is doing its best to catch up. 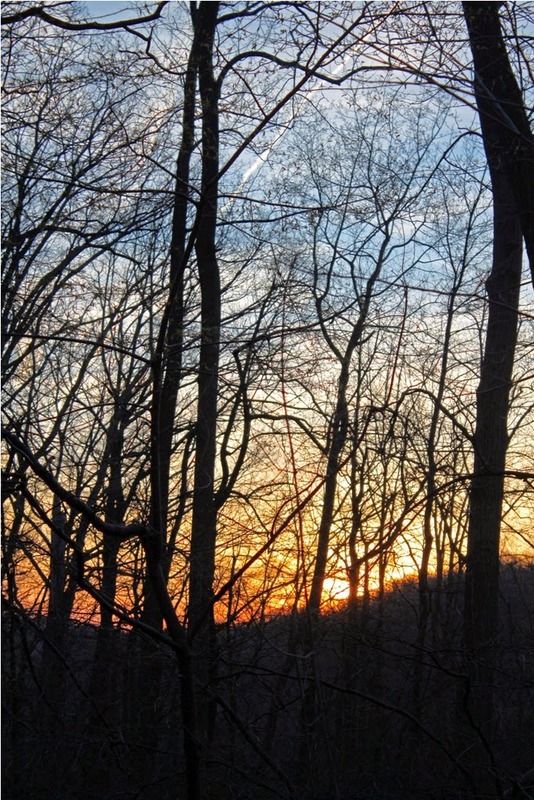 Although signs of spring can be found—phoebes, spring peepers and the like—the landscape around Roundtop is still winter brown, with nary a blade of green in sight. That will change shortly, I’m sure, but for now brown is the predominant color on the trees, on the ground, everywhere. And with it comes the Mud season, which is not a favorite of mine, just barely an improvement over the long winter, now passed. Spring is slow to start this year, in part because winter eased later than usual, but some of it is simply my own impatience to see better weather and something new to look at. I have put away the down parka for another year, though my insulated coat remains handy, just in case. The mornings are still damp and therefore chilly, and when a bit of wind is added, the insulated coat blocks that wind better than my lighter spring jackets. This morning I saw the season's first osprey, plying the air above the Yellow Breeches Creek, and two swallows, identified as tree swallows more by the early date than by any plumage I could see. Spring is coming, though the landscape is still more wintry than not. The first official sign of spring! Perhaps today’s photo will be the last snow photo I take of the winter season. Officially, it has been spring for 11 days but most of that time has still felt and looked like winter. This morning, I heard a truly official sign of spring. I heard an Eastern Phoebe outside my cabin door, singing its heart out just after dawn this morning. Spring has officially arrived now! 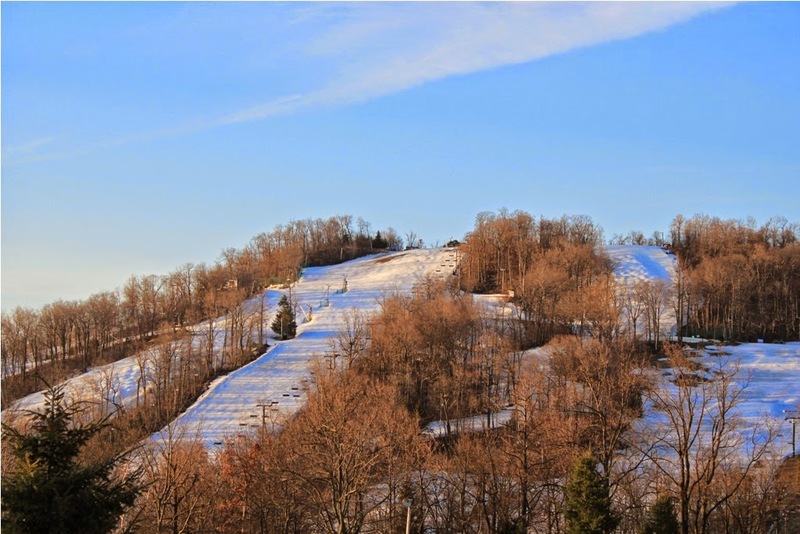 Despite the snow still left on Roundtop, the resort has closed for the season after 115 days of skiing, a record for them, I believe. For me, the closing means that the mountain is quiet again. I’m far enough over on the western side of the mountain that it’s rarely noisy from the hordes of skiers, but I do hear car noises or the occasional teenage squeal, and the total silence now is noticeable. This is the quietest time of year on the mountain. In another month or so, the leaves will be out and they are nearly never silent. They rustle and whisper to their own music, a constant background of notes and chatter. But right now, they are silent, and only birdsong fills the air.